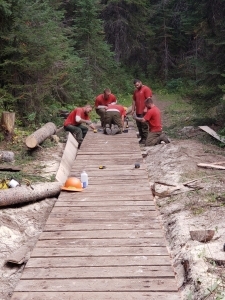 The forest service recently installed a total of 300 feet of puncheon (pronounced pun-shun) otherwise known as a plank road on the upper St. Joe trail above Spruce Tree Campground. IEFFC went in with the North Idaho Fly Casters to purchase the 5″ twisted spikes used to nail down the individual planks. The puncheon sections will keep hikers and pack horses out of the mud which will reduce the amount of mud that gets washed into the St. Joe.